Stock # C02928, 7.3L DI V8 Turbo-Diesel Engine, Automatic, 239777 mi. BRAND NEW TIRES, BRAND NEW TRANSMISSION (7/2017, NOT REBUILT)!! 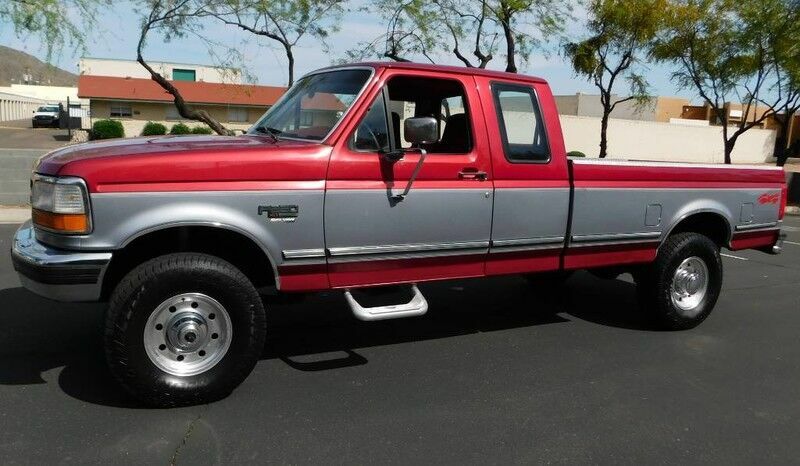 1995 Ford F250 Super Duty Super Cab Long Bed XLT Pkg 7.3L Powerstroke Turbo Diesel 4X4 with ONLY 239,777 BABIED MILES!!! This truck is in great shape throughout. This truck starts, sounds, shifts, smells and looks amazing. Zero Injector Stumbles on a cold start. This one Rides smooth and straight with plenty of power. Feels extremely solid under duress. This rare find has never had any type of engine, intake or exhaust modifications! Bone Stock Mechanics the way Ford intended it to be. Everything works properly and it has been completely inspected and serviced. I would not hesitate to drive this truck cross country and back right now. This Rig Is That Solid. This is a 2 Previous owner truck that has zero rust on the body. Plus, It has never had any accidents or damage history reported. This truck was just traded in by a 75 year old gent that purchased another newer 7.3 Diesel we had. He wanted the wife to have a Ext Cab SB so it would be easier to park. In Mid 2017 He paid good money to have a brand new transmission installed. Not a Rebuilt Transmission, a Brand New Jasper Transmission! Since the truck has been here we did have the hood repainted due to some sap marks and we installed 4 Brand New 285/75r16LT Tires along with a new windshield. Every time you turn the key, it cranks twice and fires immediately. I can't think in 25 years of selling diesels I have ever seen a truck fire over so responsive. Sounds solid as well. The A/C blows so cold you have to turn it off quickly. No Joke. Runs down the road strong with great power! Minor expected steering wheel play at dead center. Folks' be realistic. This is a nearly 25 year old 3/4 ton truck. Although, I would say for it's age and mileage the cosmetics are as good as you will ever find used. I've come to learn some buyers can be unrealistic. It does look as good as the photos but under extreme close up scrutiny you will find a minor dings, scratches and chips that have been touched up here and there. Nothing big. Only minor chips and scuffs. If you want to call me I will walk every panel with you. The dash does have cracks under the mat.